It was five months before he and 12 other physician colleagues would publish a study in The Lancet 1 calling for more research into a possible association between inflammatory bowel disease, MMR vaccine and developmental delays in some children. I met Dr. Wakefield that day in 1997 in the auditorium where our conference was to take place as he was trying to decide what to do with a slide that identified him as being employed by the Royal Free Hospital. You see, he had received a telephone threat from London in the middle of the night warning him that if he spoke at our conference, he might not have a job when he returned to Britain. He then described to me the intense pressure he had been under from senior health officials in Britain to withdraw from our conference. This was five months before he and his colleagues published the first article in the medical literature suggesting there might be an association between vaccine induced chronic inflammation in the body and developmental delays in some children. In September 1997, Andrew Wakefield was a young British gastroenterologist, a rising star in the world of experimental medicine. He had received awards and scholarships for original research into the pathogenesis and etiology of inflammatory bowel disease, including Crohn’s disease. He had a bright future ahead of him until he examined children suffering with both inflammatory bowel disease and developmental delays and decided to investigate the reports by parents that their once normal children regressed and began exhibiting symptoms of autism after getting an MMR shot. So, as Andrew Wakefield and I were standing in the conference auditorium five months before The Lancet article was published, I told him that he did not have to speak at our conference. I told him it was not worth losing his job. I told him that I could look back and count the doctors lying on the road, who had lost their careers because they dared to conduct research into or speak about vaccine risks. I told him his own colleagues would hang him for challenging the status quo. Despite the fact he had been threatened by senior doctors in positions of authority demanding that he withdraw from our conference, Andrew Wakefield refused my offer to stand down. He said that if he did not speak at our conference, he would always be afraid and he was not going to live in fear for the rest of his life. And then we sat down and had a long talk about freedom of thought, conscience and scientific inquiry. We talked about fear and courage, about risking it all to do what is right. We talked about events leading up to World War II in Europe and how good people did nothing when they had the chance to act; how instead they turned away from the suffering of minorities targeted for destruction. We talked about government health policies that devalue individual life and write off some as acceptable losses in service to the rest. We talked about the suffering of vaccine injured children and their families. And I knew then, that despite my warnings to Andrew Wakefield that he could lose everything if he tried to investigate or speak out about vaccine risks, this man was not going to stand down. He was going to risk it all. It was a moment I will never forget because I knew the price he would pay for standing up to colleagues ordering him to salute smartly and remain silent. Today, doctors in positions of authority in Britain, who have sought to intimidate Andrew Wakefield even before the February 1998 Lancet article was published, have declared through the General Medical Council that he and two other brave doctors, who refused to recant the conclusions of The Lancet article, are guilty of professional misconduct. 2 The General Medical Council does not operate a legal court of law; it is rather a medical court of opinion, where doctors can sanction other doctors and, in effect, hang their own. I learned early on in my 28 years of work to prevent vaccine injuries and deaths through public education and defend the informed consent ethic in medicine, that it does not matter whether you are a doctor investigating vaccine risks or a parent of a once healthy child, who regressed into chronic poor health after vaccination. If you question the quality of vaccine science or policy, you will be demonized, harassed, and sanctioned for being an unbeliever and questioning the wisdom of doctors and scientists in positions of authority. The General Medical Council inquisition was never about the three doctors they put on the rack and found guilty on most counts. 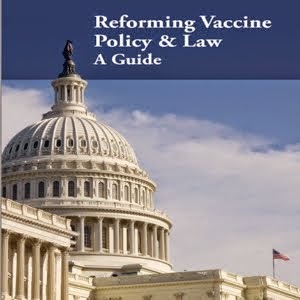 It was always about declaring vaccine science and policy innocent on all counts. And creating a horrible warning to any young doctor, who even thinks about investigating or talking about better defining vaccine risks, to think again, shut up and salute smartly. Today, I join millions of parents of vaccine injured children around the world, and thank Drs. Andrew Wakefield, Simon Murch and John Walker-Smith for having the intellectual honesty, conscience and courage to stand up for truth and freedom in science. You are honored and loved by many for what you have done to try to help ease the suffering of the growing numbers of vaccine injured children and prevent more children from joining their ranks. Like you, we will not stand down and we will not be silent. We will stand up and defend truth and freedom for as long as it takes to bring both back. 1 Wakefield AJ, Murch SH et al. The Lancet. Ileal-lymphoid-nodular hyperplasia, non-specific colitis, and pervasive developmental disorder in children. February 28, 1998. 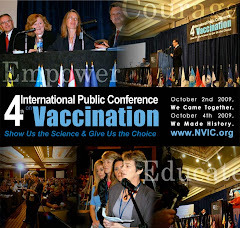 The National Vaccine Information Center (NVIC) supports the past, present and future scientific research into the reported association between inflammatory bowel disease, developmental delays and vaccination in young children conducted by Dr. Andrew Wakefield and other physician scientists. Dr. Wakefield’s work to define the pathogenesis and etiology of chronic inflammation in the body that can affect brain and immune function is commendable. His work has led to biomedical interventions for children, who have become chronically ill and disabled after vaccination, to ease their suffering. Research to better define the association between vaccination and chronic inflammatory disorders that affect brain and immune function should be given a much higher priority by government, industry and academia. Understanding the biological mechanisms for vaccine induced chronic inflammation in children and adults can help identify those at high risk for suffering vaccine reactions, injury and death and lead to adoption of safer vaccine policies. Those who criticized the quality and quantity of government regulated vaccine science or questioned the ethics of mandatory vaccination laws were marginalized by those in positions of authority, 18 who defended the status quo. The fear, prejudice and intolerance defining the first decade of the 21st century 19 was eventually turned on parents of vaccine injured children, 20 21 22 who were asking doctors and public health authorities how many vaccines their children were going to be forced to take 23 24 in the name of protecting national security and the public health. September 11, 2001 was a day of indescribable loss. And the losses America suffered that day have been magnified by the losses we have suffered since that day because some have used fear as a political tool to silence criticism of government policy.